Police are searching for an unidentified man who shot two people outside of a popular Palm Springs gay bar. The shooting happened just after 2am at Toucan’s Tiki Lounge. Neither victims’ wounds were life-threatening. Police say the incident started inside the bar when two people got into an argument and were thrown out of the establishment. Authorities haven’t released complete details, but say someone fired two rounds in the parking lot, striking one person outside and one person in the bar. Both victims were hit in the lower parts of their body. The shooter was described as Hispanic male in his 20s or 30s. He was wearing a black hoodie, black hat, black sweatpants, and had neck tattoos. Police are asking witnesses to step forward. They say several people saw the shooting, but fled before police arrived. 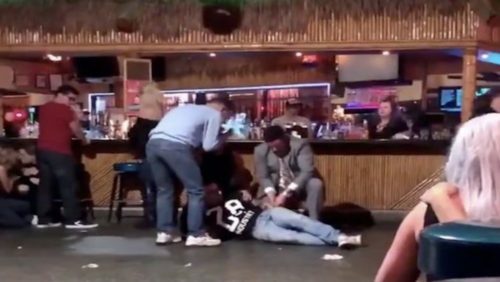 Footage shared on social media show patrons hiding under tables and assisting one of the victims. Anyone who witnessed this incident is asked to contact the Palm Springs Police Department at 760-778-8411.